Divorce proceedings between Meru Senator Mithika Linturi and his estranged wife, Marianne Kitany keeps getting uglier by the day. Her recent confession about her ex-husband ended up angering a number of Kenyans who took to social media to air their disappointments. Kitany told court that she’s walking away from the six year marriage because her Linturi fails to perform in bed. “Linturi was unable to rise to the occasion in the bedroom on several occasions, claiming exhaustion, sickness, but for most of the part he simply could not,” she claims. The two, who met in 2013 at Deputy President Willian Ruto’s office, are in the middle of an ugly court battle for property. The two came to the union with three kids each from previous relationships. They both confessed that their kids bonded well so much and even started companies together. Violent Kitany, however told court that the senator was always violent and used to demean her while at home. She also said he was very discriminatory towards their children, especially Kitany’s children. She added that he actually married her while still having another wife and didn’t share. “He would buy gifts for his children to the exclusion of my own, take private trips for himself without any of the family,” she said. Adding: “The defendant, if as he claims, did not have capacity to marry, committed the criminal act of bigamy contrary to Section 171 of the Penal Code of Kenya. If he did not divorce his wife Mercy Kaimenyi he commit the criminal act of forgery of court documents,” she said. 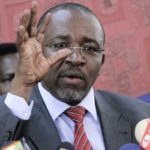 The post ‘Tabia ya Vera!’ Outrage as Meru Senator Linturi’s ex- wife tells court she’s walking away coz he’s poor in bed appeared first on Ghafla! Kenya. Next Post: How to reverse eWallet payment in 2019?